This post is based on the Lovely Maria of Lost in a Spotless Mind’s Defining Style series, the first post in particular. In this series she writes brilliantly about how to use inspiration photos, mood boards and other clever tools in order to pin down your own personal style. Maria is a fashion consultant by profession, so this online crash course in personal style is not to be missed! No real surprises there, but nonetheless fun to see in list form. I prefer eye makeup over lip color because I eat and drink more or less all the time, I wear flat shoes because I walk everywhere, and I have a real penchant for black and jewel tones. I own more faux fur than most sane people, and I love a good manicure! 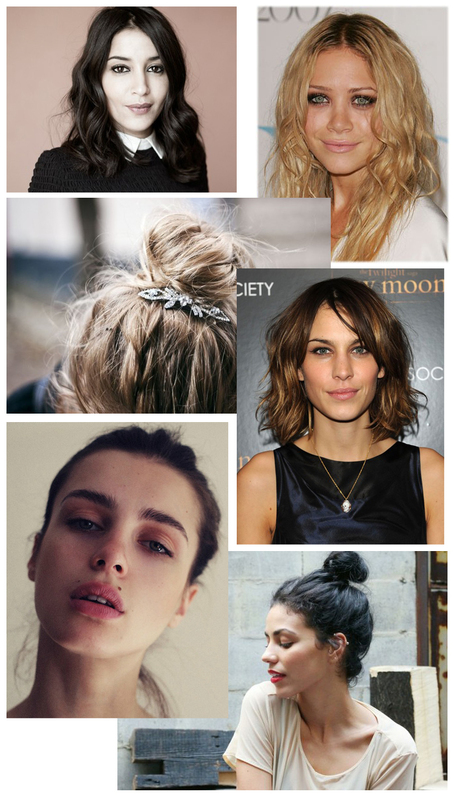 The next step was to create mood boards – one style board, one accessories board, and one for hair/makeup. As you can see I´m all about legs, neutral colors and a good handbag. I know I can always count on my striped tops, I mostly wear black skinny jeans or a good, flippy mini skirt, and i love a good parka. When it comes to clothes I hate fuss and I have to be comfortable, but I still want to look great. Onto accessories – if you think you’ve seen these before then it is because you have. These are all items that currently live in my closet! I love classics, and if I can put a little biker/rock chic/whatever the word-du-jour is twist on it then I’m an even happier camper. Also, I’m a sucker for a great scarf. Last but not least – hair and makeup. When it comes to hair my I don’t spend much time on it – I love buns, dry shampoo, sea salt spray and general under-control-messiness. It also tends to get a bit lanky and flat if left to it’s own devices, which naturally means that I like it big and textured. You always want what you don’t have, right? Because of my previously mentioned snacking habits I prefer good eye makeup over lip color, preferably combined with light and dewy skin. Phew! 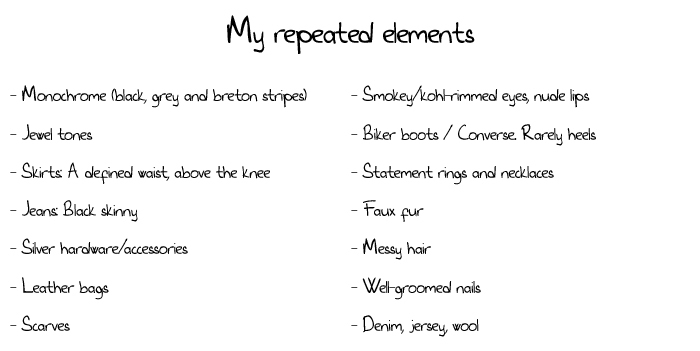 That was it for my little style rundown – if you feel like doing one of your own I suggest you scurry over to Maria’s original post and follow her instructions. Oh, and make sure to leave the link to your post in the comments, because I know she’d be absolutely thrilled to see what other bloggers come up with! → Decluttering: not only for closets! ← The perfect wardrobe… Then what? I came over to your blog via Out of the Bag. I’m loving it so far… Your post on the perfect wardrobe was brilliant!! 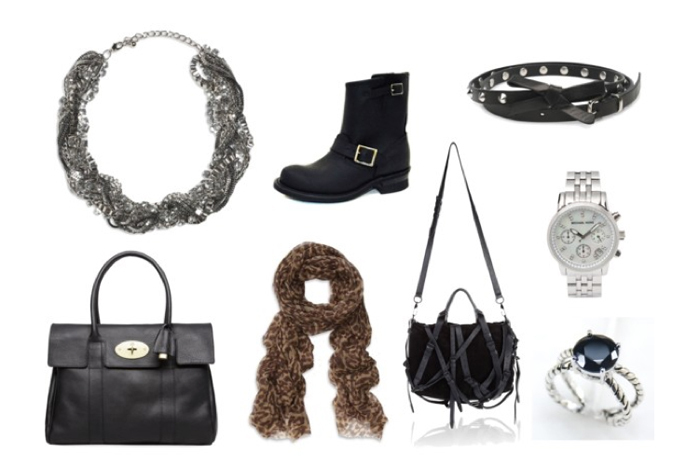 And I love that you can narrow down your style so well like this..
Hello Helin, and welcome to my blog! It is so much fun to see new names pop up in the comments. Haha, I better start this myself soon :) 36 years and I’m still wandering about..
You fine girl! You’re style is very classy, you would fit right into Paris. Moi – I like bright colors, which is not for any Parisienne. Oh wow! I already loved Maria’s post, but seeing you put it into practice so incredibly well is about to make my poor little heart explode from all the pretty! I should probably bake something… get it out of my system. I definitely see the Parisienne in your style, maybe bits of Tokyo and London too. Your style is so cool, especially since it seems to fit YOU so well. Knowing what you like is just as important as knowing what looks good on you. Last year, I had to give an oral presentation and was required to “dress professionally”. Wearing grey and black pants, a black shirt and (my sister’s, since I don’t own one) blazer was one of the most important moments of my style evolution since nothing was wrong with the ensemble, but I took one look in the mirror and said: “I look like I have no soul”(I’m dramatic that way) and proceeded to clip a large purple rose in my hair so I could at least FEEL like myself. I don’t want to write off blazers entirely, but I doubt I’ll ever be a CEO. Your style posts are awesome! BRETON STRIPES!!!! Thank you so much for the lovely comment Trajena, I’m so happy to hear that you guys can actually see, well, ME in my mood boards! I think realizing what doesn’t work for me has been one of the most important things – I love pretty, high-heeled shoes, but I always end up in agony whenever I try to wear them for an entire workday. Same with elaborate lip makeup: I love the way it looks (and will still wear it on off days), but let’s face it – I’m a compulsive snacker. Also, I’m way too nice and friendly and mellow to be wearing pastels and florals and ribbons and bows. Nobody would take me seriously. I need my black. Darling, this is wonderful! It’s, essentially, you in mood board form. I’m impressed.